We are thrilled to announce that Artist Build Collaborative, a BAC Fiscally Sponsored Group, just received a 2013 ArtPlace America grant for $33,000, which will support the installation of their project Silent Lights. Artist Build Collaborative was one of 134 groups from among 1,225 applications from across the country. 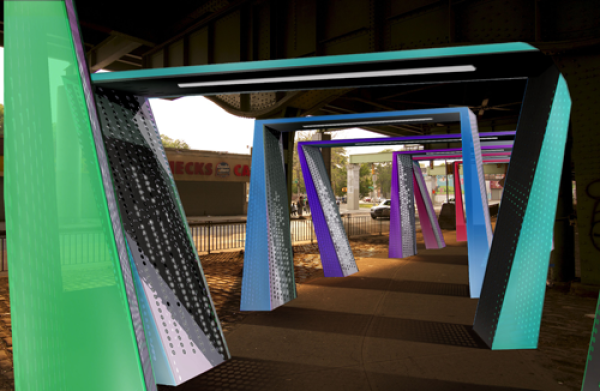 Working in partnership with the NYC DOT Urban Arts program, Artist Build Collaborative will install Silent Lights, a series of six gates that light up sequentially based on the intensity of sound and vibrations from oncoming traffic. The installation will offer a safer and more inviting experience for pedestrian commuters as they traverse a loud, poorly lit and busy underpass linking Red Hook, Brooklyn to its closest subway stop. Learn more about BAC Fiscal Sponsorship.